Within Aotea Square the roof of the Civic carpark was replaced. 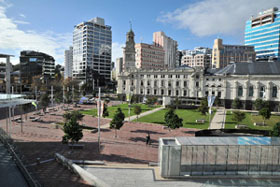 This is turn required a complete revamp of the Aotea Square in central Auckland. ComSec was commissioned to supply the infrastructure cabling solution and the integrated sound system. Within the square there are now 22 utility hubs supplying audio, data and power. There are 36 Renkus Heinez loudspeakers driven by Lab.Gruppen amplifiers and nion processor. Each loudspeaker is controlled individually. Sgx1201 waterproofed loudspeakers, colour matched. During this project ComSec worked effectively with main contractor Hawkins, MWH Global (civil and electrical consultants), Marshall Day (acoustic consultants), Architectus and The Edge (Aotea Client). ComSec also subcontracted VideoPro for the electronic signage solution within Aotea Centre Café Box Office. As the project progressed some areas required re-engineering to enable the cabling ducts to be installed within very tight physical constraints. Creative solutions were frequently required.